As a high school student in Pittsburgh, Mike Barnes was a newcomer to the game of football- starting his career as a prep senior in the football rich area of Western Pennsylvania. As a three year starter at defensive tackle for the Miami Hurricanes, Barnes developed his skills and established a career that distinguished him as one of the very best in a long legacy of excellence along the UM defensive line. Barnes had the rare blend of size, speed, reach, quickness and aggressiveness that characterized a complete defensive lineman. He is described by long-time UM defensive line coach Harold Allen as "very hard worker who played with intelligence and intensity. He was also an excellent student", adds Allen. "He was quiet and reserved- until he stepped on a football field." Nicknamed "Bad News" Barnes, his presence on the field usually spelled trouble for opposing players. Barnes went on to reach his highest level of football acclaim while starting for 10 seasons as a defensive end for the Baltimore Colts in the NFL. In 1977 he became the Defensive Lineman of the year. 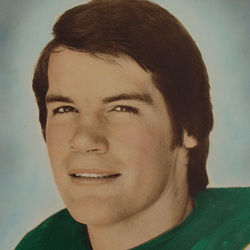 He capped his outstanding pro career by earning Pro Bowl honors in 1978.